The news of the union between Alhaji Ahmed Indimi and Zara Buhari that was set to be wed very soon has been the talk of the nation since it was publicized by the media. People should look into their hearts and search their souls. No one on earth has the power to undo what God almighty has ordained. Not even "PRESIDENT MUHAMMADU BUHARI, ((GCFR) or ALHAJI MOHAMMED INDIMI" will have the ability and capacity of undoing the union of the couple...'s. On the other hand, if God almighty does not command it to be, President Buhari, (GCFR) and Alhaji Mohammad Indimi cannot make it happen. (KUN FA YAKUN! ), which mean's, (BE AND SO IT SHALL BE!). Our trust will forever be in "GOD'S HAND'S. We have absolute submission to HIS WILL and believe in God irrespective of religion, ethnicity, status or material benefit's in society. The setback with regard their marriage is disappointing but only God know's best. I would like to remind people that spreading such bad news on any platform, especially social media is a sign of negative exposure and may be regarded as a sin to a certain extent, which is forbidden by God. "THE LAW OF KARMA ALWAY'S PREVAIL'S". If we cannot pray for them and be happy with the union that was intended as one of GOD'S grace's and if we do not have anything good to say, then it's best to keep mute and take things as they are. 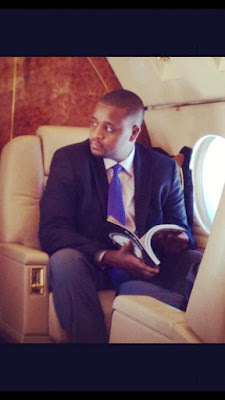 Zara Buhari is the daughter of a President and Ahmed Indimi is the son of a billionaire. The luxurious item's that were presented by Ahmed Indimi's family that was publicized in the media is nothing new and was expected. It is not the first time it has happened and it most certainly will not be the last time, because other's have done more than that in the past. Why is this one an exception to be frowned upon? However, we cannot overlook the fact that while the nation is in recession, it is morally wrong for the President's family and the elite's to publicize such extravagance in a country that has been devastated by insurgency, hunger, insecurity, ethnic and religious clashes. The masses and indigenes from the northeastern part of the country are still trying to recover from the horrifying experience and destruction of their livelihood, especially, when both families have ties and are from the region that experienced the full wrath of the devastation. To sum it all up, who are we to judge what God almighty has ordained? May God almighty continue to bless, guide and protect us with his infinite mercy. Amin.